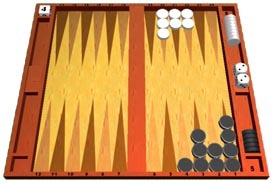 Virtually all of the books and articles written about how to play backgammon teach you the right plays and the right strategies with the assumption that you are playing against someone who will always make the correct moves and cube decisions against you. Clearly, that is the right assumption, because if you make decisions based on that, you will optimize your position. If you are fortunate to be playing someone who makes less than the best decisions, you will come out even more ahead by making what is technically the best move or play. My advice to all is that you certainly should base your study of the game on the assumption that you are playing a perfect player. Many tournament players, including myself, practice their game by playing against the computer programs and study positions using Snowie, GnuBG and Jellyfish to find out what is the best play or cube decision. These programs are not always right, but they are usually right and generally when wrong, they are not wrong by much. The reality, however, is that most of us are far from perfect players. We all make mistakes, and we all have some tendencies to make the same mistakes over and over. The farther you are from being one of the best players in the world, the more mistakes and more error-tendencies you have. Given the above assumptions, then in reality, it is not always best to make decisions the same way the computer, or the experts would. If you are playing a human who is less than perfect, and they have specific tendencies (or faults) that are reasonably predictable, you should adjust your game to take advantage of those faults. Your biggest opportunity to take advantage of an opponent's weaknesses is in the use of the doubling cube. If you play someone who is consistently very scared about taking the cube and who often drops cubes that are takes, it is probably correct to give this person early cubes. Every time he/she drops a cube that is a take, especially if it is not even technically good enough to cube, you have gained tremendous equity. In the position below, I was White and on roll. I was playing against someone who I know has a major fear of getting gammoned, and that person has a tendency to drop every cube that looks like it could turn into a gammon. So I doubled, and he dropped. I put this position into the computer program and it says that it is not good enough to double, and of course, if doubled, it's an easy take. By the way, if he had taken this cube it was not a blunder for me to double, as I was clearly a favorite. Below is another example that came up recently in a match that involved Neil Kazaross, one of the best players in the world. In the position below, it is a match to 7 and the score is tied 0-0. Neil's opponent is White, and he has a 4-cube, and he has doubled Neil. Neil must decide whether to take or drop. If Neil takes this cube, whoever wins the game wins the match, so clearly Neil should take if his odds of winning this game are over 24 percent. Neil calculated the odds of his opponent missing twice, and decided that he did have more than 24 percent. In fact, Snowie says he has about 28%, so Neil was correct. And Neil took the cube and lost the match, because his opponent rolled well. In this position, Neil gained 4 percent by taking, and one of the reasons that Neil is one of the best players in the world is that he usually makes the right decisions and doesn't give away 4% on a single decision very often. But did he really make the right decision here? I don't think so. Neil was not playing a computer, he was playing a human being. And although he was playing a very fine player, Carter Mattig, he was clearly playing someone who was a worse player than he is. If Neil had dropped and played Carter a few more games, isn't it likely that the difference in skill would more than make up for the 4 percent equity loss by dropping here? I think so. One small blunder by Carter on an important checker play or cube decision could more than give Neil his 4 percent back, and the position above is a simple bearoff, and the skill difference between Neil and Carter is not likely to come into play in this position. "Using the tables on pages 34 and 35 from Can A Fish Taste Twice As Good?, we find that a player with a 100 rating-point advantage is 27.3% to win from 7-away, 3-away, while a player with a 150 rating-point advantage is 29.4%. Interpolating it seems Neil (who has doubtless memorized these tables) felt Carter was within 130 rating-points and took." So using Jake's logic and tables, Neil is correct to take if Carter is within 130 rating points. The problem here is, nobody truly knows, for sure, what anyone's rating points really are. We can only guess. I discussed this with a few other top players, and there was a pretty clear consensus. Being one of the best players in the world, we can assume that Neil would have a rating of around 2200. Carter is a very excellent Open level player, but even giving him the benefit of the doubt, his rating is probably not any higher than 1900 (Carter would be proud to have a 1900 rating, as just about anyone would be). So with a 300 point difference, while Neil made the technically correct decision, he did not make the best decision playing against a human. 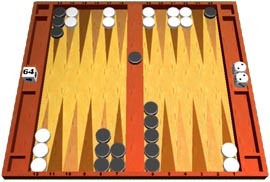 Altering checker play to take advantage of opponents' weaknesses is a much trickier and more dangerous proposition, as generally, you will come out ahead making the best plays according to the computer programs and experts. However, when you know you are playing a clearly inferior opponent, you might well do better making plays that lead to back games and holding games and prime vs. prime positions and avoiding pure racing positions. And when I am playing Neil Kazaross, I am much more prone to make big plays and gamble to win. I know these big plays have cost me matches against the likes of Neil, but I am convinced that I have won more than my share of matches over the years against the likes of Neil because of these gambles. Against equal or better players, it is often correct to take a major gamble to win the game or the match. You might slot a point in a situation whereby if you get hit you probably lose the game or match, and if you don't get hit you probably win the game or match. This is often the right play at double match point. Taking that same risk against a weaker opponent may not be correct. As good players know, money play is far different from match play, and when money comes into the picture there is great potential to add even more human error and weaknesses. I know money players who just love to gamble, so the higher the cube, the more likely they are to take regardless of the odds of winning and losing. Conversely, many players are much more likely to drop the bigger the cube is. Not to take advantage of these proclivities is an error, and it's something that computer programs will not teach you. When it comes to cube play, I absolutely do think about who I am playing and what their tendencies are and what their skill level is compared to mine, but when in doubt, I use Woolsey's Law. If I am not sure whether to double or not, I double. I might be wrong to double, and I might be wrong if I don't double, but I don't give my opponent any chance to make a mistake unless I double. And to quote my great, old (departed) friend, Dean Meunch, "Doubling is fun!"